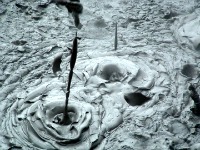 One day in Rotorua! I cannot believe you're only coming here for one day. What are you thinking? That's what sometimes happens though. It's a toss-up between what to include or cut, especially if you're travelling throughout New Zealand. Poor you, I can totally relate to that particular dilemma. 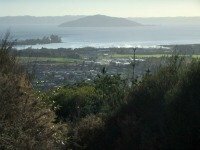 If you want to capture the essence of Rotorua in the least amount of time then a medley of tours would be the best way to go. At least with tours you can sit back, relax and take in the sights. There is no worry about traffic and finding your way which also saves on time. Following are links to a small selection of tours that will give you a good insight into this most fabulous city of ours. Have fun now. In this 5hr tour beginning at 7.25am with pick-up at the i-Site or your accommodation, you will see the quintessential Rotorua including Māori Culture, geysers and mud pools at Te Puia, an interactive sheep show at the Agrodome and the ever-popular Rainbow Springs. Optional extra add-ons include a Skyline Gondola ride or a visit to the Hobbiton move set. With the Hobbition option the tour finishes at 6pm. This 4hr tour, beginning at 8.30am, is super focused on the jewel coloured waters of Wai-o-tapu, Lady Knox Geyser and the drive through Waimangu Volcanic Valley. The guides are extremely knowledgeable as well as entertaining. Pick-up and drop-off is from your hotel. You can always take this tour in addition to the above to make a full day of it. This is another 4hr tour, beginning at 1pm with pick-up from your hotel. 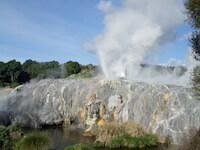 Visit Te Puia to view the famous Pohutu Geyser and thermal action in abundance, also the weaving and carving schools. Then it's onto the Government Gardens with lots to learn about the history in that area. To finish you'll be taken out to see some of our best lakes: Okareka, Blue & Green Lakes and Lake Tarawera with views of Mt Tarawera. If learning about thermal is at the top of your list, this 8hr day tour, beginning at 8am, is tailor-made for you. 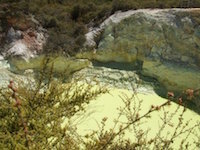 Waiotapu and Waimangu Volcanic Valley fascinate with eruptions, mud pools and boiling hot springs. This is followed by a visit to the Blue & Green Lakes and the Buried Village where our famous volcano, Mt Tarawera, can be viewed. 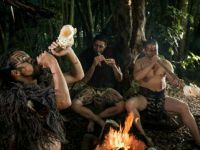 To finish off the day in style, opt for a total immersion experience into Māoridom with a hilarious bus ride out to Tamaki Māori Village where you will challenged, educated, entertained, and fed (with a real Māori hangi) until your belly is bursting. It's a perfect ending to your one day in Rotorua and fits in with all the tours mentioned above. Prepare for a sensory overload.